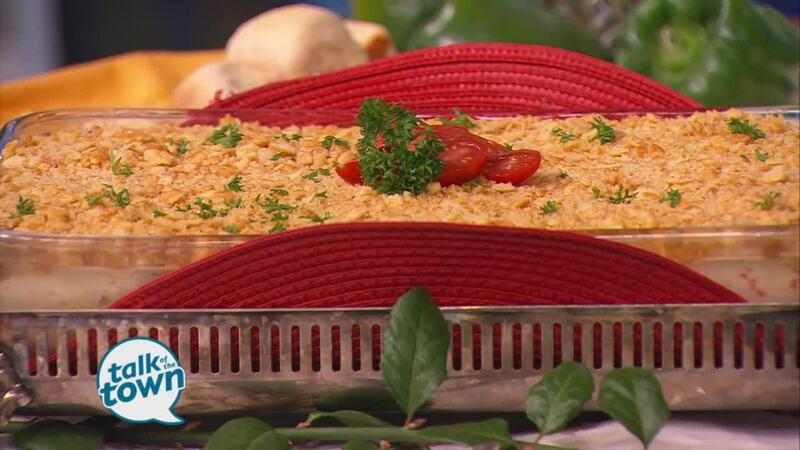 Daisy King from Miss Daisy's Kitchen made made Crunchy Chicken Casserole. (see recipe below) Miss Daisy's Kitchen, with gourmet takeout and specialty foods, is located at 1110 Hillsboro Road, in the shopping center at the corner of Mack Hatcher and Hillsboro. For more information, call (615) 599-5313 or visit www.missdaisyking.com . Assemble ingredients and utensils. Combine chicken, water chestnuts, pimientos and eggs in a bowl . Mix together soup and mayonnaise and add to mixture. Pour into a 2 quart Casserole dish. Top with cracker crumbs and butter which have been mixed together. Bake in a 350 degree oven for 30 minutes. Yield: 6 -8 servings.